Quick overview Each chapter features insights from researchers along with hands-on tasks and self-evaluation exercises to help readers develop their own strategies for success.This detailed, step-by-step guide to the secrets of successful PhD writing will be essential reading for PhD students and their supervisors across a wide range of disciplines. This is an invaluable guide to developing the writing skills needed to succeed at every stage of postgraduate research. It provides useful guidance on writing clearly and coherently, and covers core topics such as exploring key concepts through writing, building a structured chapter framework and completing a first draft. Each chapter features insights from researchers along with hands-on tasks and self-evaluation exercises to help readers develop their own strategies for success. 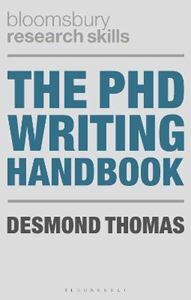 This detailed, step-by-step guide to the secrets of successful PhD writing will be essential reading for PhD students and their supervisors across a wide range of disciplines.